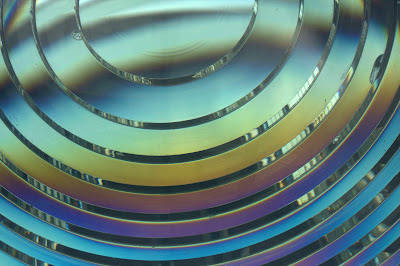 This first-order Fresnel Lens is at High Street Landing in Portsmouth Virginia. It began service in 1896 as part of the Hog Island Light off the Great Machipongo Inlet on Virginia's Eastern Shore. This type of lens was invented in 1822 by French physicist Augustin Fresnel. Rather than merely reflecting light, it used hundreds of prisms to bend and concentrate the light in a powerful beam. Canon 40D, 1/3200 sec at F/4.0, ISO 160, focal length 75mm.